There is absolutely nothing wrong with being buried in a cemetery. Cemeteries are beautiful and designed to help loved ones and future generations feel a connection and maintain a memorial to those they have lost. However, there are now so many interesting alternatives that most people are at least entertaining the idea of skipping interment altogether. We encourage you to explore all of the fun and whimsical and beautiful ways and places that your remains can be used or dispersed. And we hope that you will contact us to help you figure out the right way to plan for and carry out an after-life vision and the funeral that will accompany it. One of the most interesting alternatives available is for your body to become a diamond. Available in many cuts and colors, as just a stone, or set in a piece of jewelry, after death your ashes can be compressed into precious stone. These diamonds are indistinguishable from diamonds not made with the remains of a human being and they are growing in popularity. 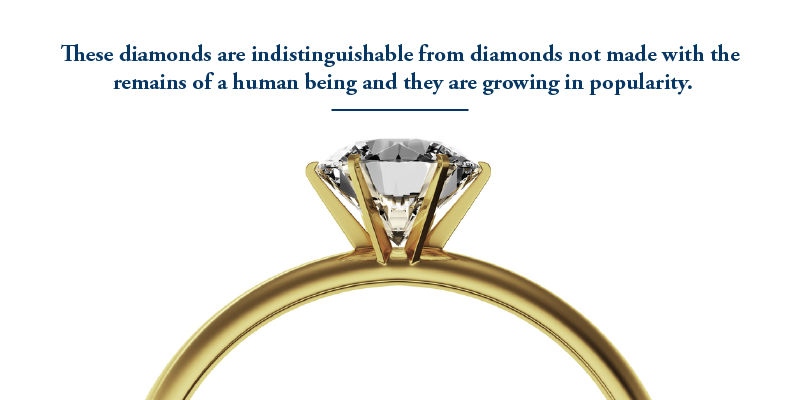 While there have been some cases of people making the decision to be turned into a diamond and then to be sold, it is much more common that this is carried out to provide a gift to a special loved one and then to become an heirloom passed from generation to generation. Costs vary depending on the size, color, cut, and quality of the gemstone. If you decide to go this route it does not preclude you from having part of your ashes interred at a cemetery and having a marker or headstone so that all of your loved ones can easily come and visit. As our society becomes more environmentally conscious many people are opting for green burials. One of the best ways to accomplish this is to be interred in a way that provides the nutrients for a tree to grow. Generally this is a cremation option and can happen inside of the cemetery of your choice, where the groundskeepers will perpetually see to your every need. 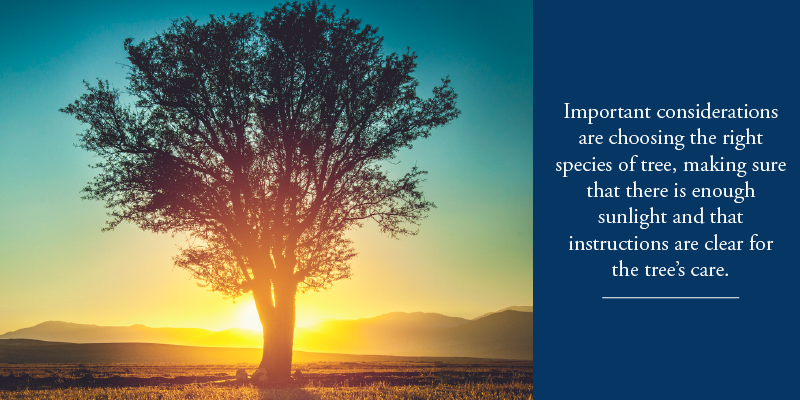 Important considerations are choosing the right species of tree, making sure that there is enough sunlight and that instructions are clear for the tree’s care. This is a beautiful opportunity to give back to the planet and live into the future. You can also have your ashes split between two or more trees so that you can grow in different places and even different types of tree (think fruit, shade, and living Christmas). In the future there may be the alternative of having your entire body put into a pod from which a tree grows; although at the time this is not widely available largely due to regulatory issues and technology. While this has not become quite as popular as the diamonds and trees, there are people who are making the decision to have their, or their loved one’s, bodies turned into art pieces that are put on display. Again this is generally a cremation alternative, as the ashes are integrated into glass, metal, resin, or some other composite and then shaped into a sculpture. It is not hard to imagine these sculptures popping up in memorial parks and cemeteries, in much the same way that granite and marble statues grace our most beautiful and historic burial grounds. Much like the tree alternative, it is possible for your ashes to be separated into two or more different pieces of art, allowing for both intimate and private pieces and public displays – even multiples of both. There are at least three different ways to donate your body. The first alternative is to a body farm, a research facility in which decomposition is studied in a variety of stages. Another alternative for donation is to give your body for scientific research of a different kind. 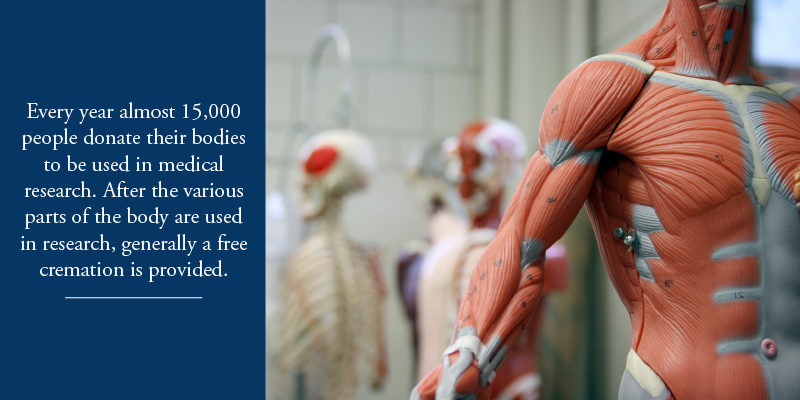 Every year almost 15,000 people donate their bodies to be used in medical research. After the various parts of the body are used in research, generally a free cremation is provided. You can also donate your body to be plasticized and used in scientific displays. If this is the direction that you are the most comfortable moving then there are ways that you can set up a lasting memorial so that your loved one can still honor you. Regardless of the direction you want to go, the first question you may want to ask yourself is, are you planning your after-life to meet your desires or to satisfy those of your loved ones? What is your budget? How do you want to be remembered? Answers to these questions and more will help guide you through your decision making. Once you are settled on a plan, we can help you to ensure that the plan is carried out as part of your last wishes and that if you want a lasting memorial you have the widest range of possible choices at one of the cemeteries we manage.